Despite the odds and internal wrangling, the national leader of the All Progressive Congress, Asiwaju Ahmed Bola, over the weekend in Kano, endorsed Governor Abdullahi Umar Ganduje for a second term in 2019. During his condolence visit to Kano, yesterday, to commiserate with Ganduje and the people of Kano State over the death of Dr Yusuf Maitama Sule, the APC leader, also used the occasion to condole, with Ganduje, over the death of his younger sister, as well as Malam Yusuf Ali, an APC leader, who recently lost his younger brother. “It is a great honour and privilege for me to be here today, It has been very tough in the last few years. I grew up in the hands of two people, who know me to my home. One of them is Dan Masanin Kano, who has just passed on. One of them is living, he is a living legend, Malam Yusuf Ali. “In fact, my bed room, where I am sleeping today, he has slept there; and he has been a great guiding light for me. He lost his brother, he lost a son, not too long ago. I have not been able to come and be with him. “Well, it is only God who gives and takes. We cannot change any date of calendar as written by God Almighty. God will continue to be with you and console you. You will not repeat the loss, you will live long for us. “And incidentally, I will repeat this when we get to Government House. Our brother, Ganduje, Your Excellency, you are saying eight years, some people are saying 12 years; but if you put coma in any line of the constitution, that is an amendment. “So, I endorse eight years, we are with it, and with all our body and soul. You are a great man–and you are a very loyal man. We have been planning to come to condole, with you, following the bereavement of Dan Masanin Kano, it is not just a Kano bereavement, but a national bereavement. We should condole with you and the people of Kano state because you are bereaved. “One thing that we must note in His Excellency, Governor Ganduje is this–he is one of the most straightforward, dependable individual. When you agree on something, or in the words of Donald Trump, ‘do a deal, with him,’ you can go to sleep because you will be the one to break that accord, not him. “Ganduje, I want to say thank you. You are so humble, so dependable. You are a friend that is completely flexible. You have the understanding of family and friendship. 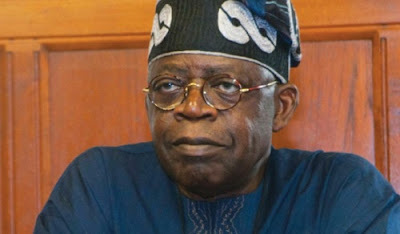 On President Muhammadu Buhari’s health and the crisis between the executive and the legislature, Tinubu noted that the crisis between the two arms of government is normal in politics. He said: “Honestly I don’t see any problem in the crisis between the legislature and executive because we are in politics and in politics, conflict and conflict resolution mechanism is an inbuilt system. Crisis, argument and communication are all part of politics and it has self-corrective process. “The National Assembly is there to voice their objective or objection if it is constitutional or take action against the opposition, while the Executive is to do the job of Executive, they don’t have to be dog and nick to one another but for the peace, unity, prosperity, harmony and progress of the country, they have to work together, they are co-joined twins. They have to work together and no one can consume one another. If they play the politics well, Nigeria will be better for it. “I am not a member of the presidential cabinet but I am a member of his party and I am a Nigerian. All we can do is to pray for him. Nothing anybody can do in the place of health challenge.